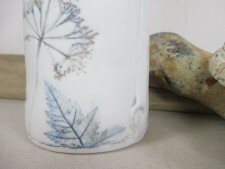 This vase is impressed with natural flowers and leaves, by Rose Dickinson in Faversham, who works in porcelain and uses flowers, seed heads and sea shells to emboss and design her beautiful ceramics. Her work is defined by the folding and overlapping joints she makes with the slab technique used, and each is impressed with her 'rb' makers' sign. 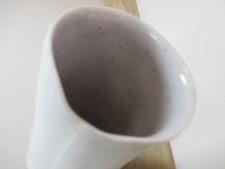 This vase is glazed with a matt exterior and mottled gentle and warm mauve/pink gloss inside. Each piece is entirely individual and therefore no two can ever be the same. You are buying on the basis of the overall idea and size and will receive an entirely bespoke item. 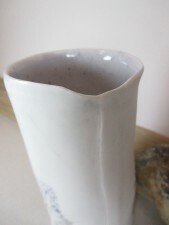 Vase approximately 17cm tall and 9cm wide. 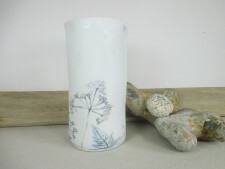 We specialise in handmade items and work with over 20 makers and artists, mainly in East Kent. We offer bespoke orders as well as a catalogue of beautifully made, unusual and often one-off ceramics, textiles, glass and jewellery. We believe in supporting and promoting independent artists and small businesses. Items ready in stock dispatched within 2 days and sent courier, charged at 2-3 day delivery. If you need items more quickly, please tell us when you order and we will adjust cost accordingly. If an item needs to be made for you, we will let you know.